Bonefish are plentiful and run big at Anagada Island. Use abrasion resistant line because there is a fair amount of rock, shell and mangrove clusters on the flats. The wind was ripping hard from the east, scuffing the surface and making it nearly impossible to spot tailing fish or even shadows on the tepid flat near Nutmeg Point. Still, it took only a few short strides toward an isolated mangrove tangle to kick up the first chalky puffs. Bonefish! Lots of them, some within 40 feet, torpedoed out from the silty bank and rounded a small sandbar separating calf-deep water from a knee-deep channel. “You should have thought!” my inner voice bellowed back, mocking as if a separate entity. Later that evening, Lawrence Wheatley listened patiently at the self-service honor bar of his Anegada Reef Hotel as I bemoaned my misfortune. “You’ll do better tomorrow,” he offered, and he was right. The very next morning, on a small, gin-clear flat slightly west of Setting Point, I would stalk slowly and quietly to within casting distance of my first British Virgin Islands (BVI) bones. 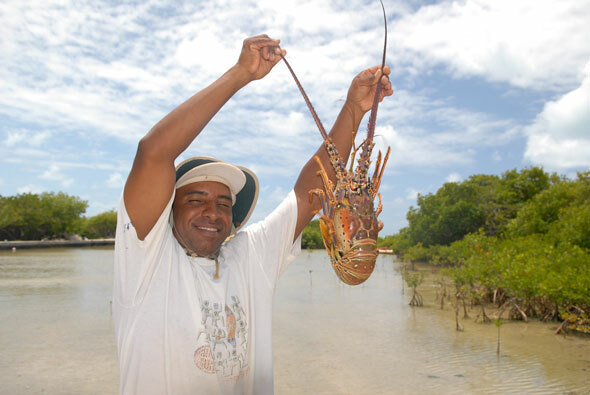 For a real treat, be sure to order the fresh caught lobster at the Anegada Reef Hotel. The tarpon at the docks here eat the leftovers late at night. My interest in the bone fishing potential of the BVI, “Nature’s Little Secrets” as they market themselves, was initially piqued by accident. A buddy who takes an annual sailing vacation to the area had mentioned seeing “a lot of fish” on his trips. When he asked to borrow a fly rod and some saltwater patterns for his next visit, I obliged. “How did you make out?” I inquired upon his return. It took all of six months before I was wading the south-side flats of Anegada Island. What I found was a secret too good to keep. 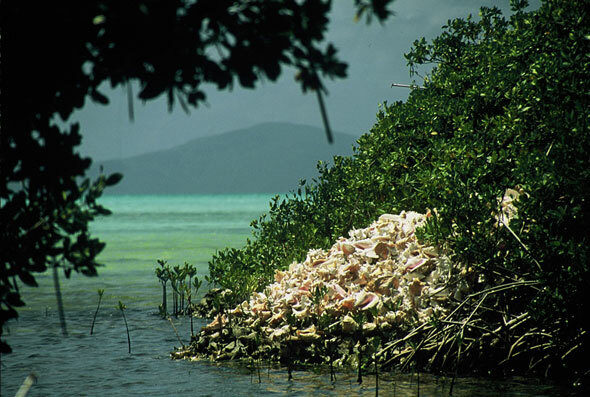 Seek out conch middens in the bays and along the flats. 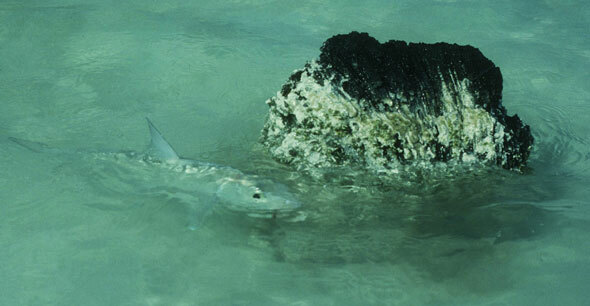 Large bonefish are often found nearby. Photo by Felicia Scocozza. The larger BVI islands, Tortola and Virgin Gorda (shown here) are ringed by coral reefs and an endless sea of picturesque fishing possibilities. Photo by Felicia Scocozza. Indeed, like most anywhere else, BVI bonefish tend to be cautious, especially when prowling the flats. You’ll find small, resident populations sprinkled throughout the 60 islands, islets and cays of this archipelago, but Anegada is where most of them call home. At only 15 square miles and nearly encircled by 18-mile long Horseshoe Reef – the third largest coral reef in the world – this magnificent coral atoll offers everything a bonefish could want. There are bays, coves, flats and coral-buffered shallows with exceptionally live bottoms. Kick over almost any conch or large snail shell and you’ll find a huge hermit crab inside. Various hard crabs, shrimp and small baitfish hide in the turtle grass, mangrove roots and piles of discarded, post-harvest conch-shells dotting the waters here. Toss in the many coral heads that reside just outside the shallows and it’s enough to make visiting anglers quiver with anticipation. That last item is key, as this is a windy place. Breezes topping 15 knots are common and gusty days not unusual, which is why sailing fans consider this paradise. December through February finds the fishing a bit unpredictable due to cold fronts, but the spring, summer and fall offer steady opportunity. Still, bonefish inhabit these waters on a year-round basis and all it takes is a relatively tame morning or afternoon to sample top-shelf action. For such a small destination, Anegada offers a tremendous amount of quality water to cover. So much so, that you’ll do best to hire a guide, certainly for your first trip. The entire south side features various sand flats but, notes Faulkner, each has its own personality and the locals know how the bones will react to changing weather patterns, tides, seasons and piscatorial pressure. A favorite spot, approachable only by boat (read: hire a guide) is White Bay. Located on the south side of the island, near the east end, this expansive flat averages about 18 inches deep. The bones here will smack a variety of flies including standards such as Crazy Charlie, Bonefish Special, Gotcha, McCrab and Merkin patterns. If you prefer to spin fish but shun using deli meats, small white/yellow or white/pink grubs work well when impaled on 1/8- to 1/4-ounce jig heads. No need to tip the jigs: just skip them lightly across the bottom and lead your target based on water clarity. For fly fishing, Faulkner likes an 8- to 9-weight fly rod, floating 10-weight line and a 10-foot long, 10-pound test, tapered leader. Spin fans can get away with a medium taper rod and 12-pound test. I’d opt for abrasion resistant line to reduce cut-offs from conch shells and coral pieces that have broken free of the reef. 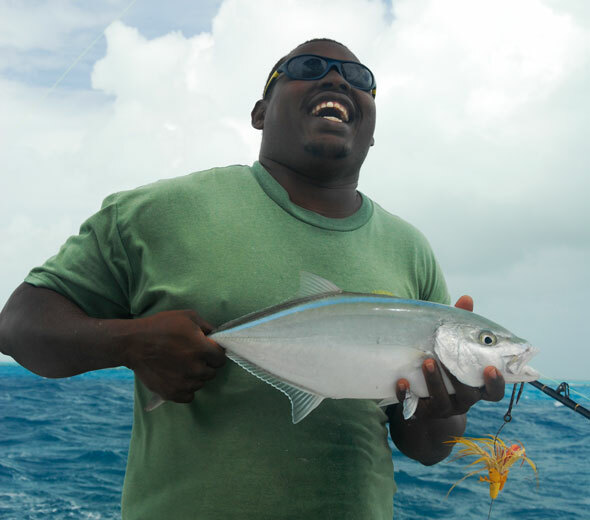 Whether you fish inshore or offshore, you’ll have a blast in the British Virgin Islands. “White’s is the premier bonefish flat on this island, but it’s not the only place worth investigating,” revealed Walter Mangum, who works at Cow Wreck Beach Resort on the north side of Anegada. He fishes “for something” just about every evening and likes to target bones on the west end of the island’s south side, near Pomato Point. Another spot worthy of consideration is aptly named Bones Bight. This is a large flat on the north side of the island, roughly mid-way between the east and west ends. While bonefish are the preeminent target at each location, you’ll find a few permit and tarpon on the flats as well. In fact, one evening I spied a pod of 40- to 50-pounders cruising just yards from the bank outside my room at the Anegada Reef Hotel. Should you decide to head out on your own, be advised that not every flat consists of well-packed sand. The base of this island is coral, and that makes for a white, fine mud bottom in some areas. In the channel that passes under the road at Saltheap Point, for instance, I sank a leg past the knee. 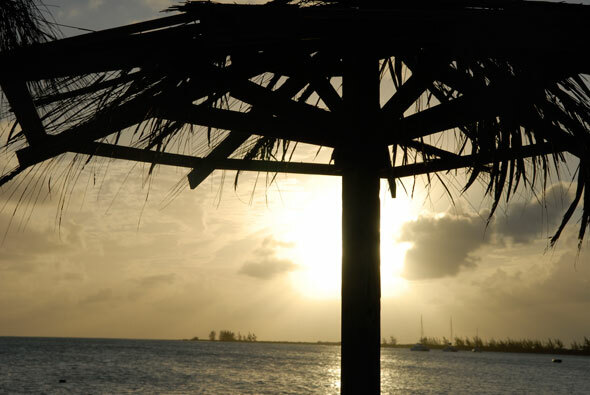 With the bones ready and willing most days, both Faulkner and Mangum agree that the biggest mistake visitors make when coming to Anegada is failing to allow enough time for serious fishing and experiencing the islands’ other natural wonders. 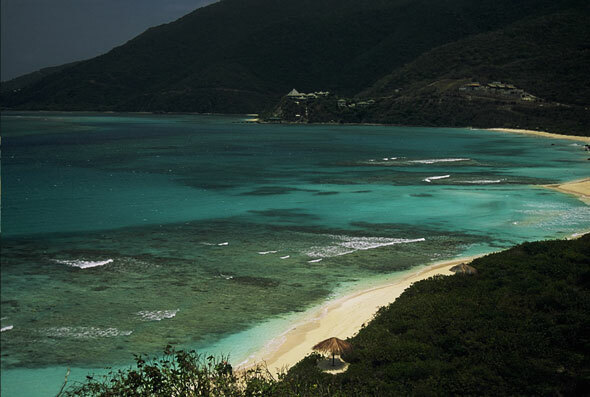 Many make a one-day detour from visits to Tortola or Virgin Gorda, two of the more popular BVI resort destinations. That’s enough time to get your feet wet, and to maybe catch the biggest or most bonefish of your life, but there’s so much more to sample here. With its desert-like interior, bumpy dirt roads and limited number of accommodations, Anegada makes no apologies for being off the beaten track and it doesn’t need to; isolation is part of the draw. The island is ringed with white sandy beaches. Roseate Flamingoes thrive on the interior salt flats, and the endangered Anegada Rock Iguana, which grows to six feet in length, calls this island its only home. Beach lovers revel in the surf at Cows Wreck and Loblolly Beaches while kite surfers savor West End Beach. You can also snorkel or SCUBA dive almost anywhere inside of Horseshoe Reef. True, some services run on “island time,” and dinner across the island sees a single seating (order before heading out to go fishing), but everything gets done by the end of the day and any angler worth his salt is planning a return visit even before boarding the flight home. I know Iam heading back. Three days simply left me wanting more. Besides, Mangum told me that when I return I should try from Cow Wreck Beach for snappers, blue runners, horse-eyed jacks and even lemon, black tip and nurse sharks. “Can’t miss action from shore after dark,” he promised. Apparently, there are secrets yet to be uncovered here. I’ll gladly volunteer to play detective. Hire a guide to fish White Bay in April, May, June or July. Cold fronts and winds are less in spring, summer and fall, allowing for more consistent access to the best bonefish waters. Work the edges of conch piles, noticeable troughs and areas around points or creek mouths. Don’t be turned off if the water is cloudy; instead look for edges where murky meets clear. Stay relaxed when the bones cruise up on your lure or bait. Although the fish are not overly cautious here, many anglers strike too soon. Fly-anglers, especially, should think of bonefish like trout on the take – a slight hesitation before driving home the point will increase your hook-up ratio. Let bonefish run after setting the hook. There is plenty of open water here and you can really come to appreciate the tremendous speed and power of these shallow water speedsters. Permit and tarpon are also found in these waters. The large hermit crabs found inside conch shells make great baits for these. Spinning gear should include a medium action spinning setup with a 6-1/2- to 7-foot rod. Fly fishermen should bring along an 8- to 10-weight fly rod. Lines: Use abrasion resistant 12-pound test in open water, 12- to 16-pound test if you plan to work around structure or seriously target incidental species like permit. For fly fishing, select a 10-weight floating line finished with a 10-foot long, 10-pound test tapered leader. Lures: Bring 1/8- to 1/4-ounce jig heads with soft plastic grubs in white/yellow or white/pink, small tins including a Hopkins Shorty and Johnson Sprite, and 2- to 4-inch swimming shads in bunker or silver. Flies: Carry an assortment of small, flashy streamers, Crazy Charlie, Bonefish Special, Gotcha, Epoxy Minnow, McCrab and Merkin patterns. - Bozo Wheatley, "Basic Lady,"
Required for fishing anywhere within the BVI. Cost is $45, counting surcharge. Contact the British Virgin Islands Ministry of Natural Resources & Labour at (284) 468-3701, ext. 2147, or ask your fishing guide or host to procure one before arrival. By boat: Ferries run Monday, Wednesday & Friday departing each location once in the early morning and once in the late afternoon. Once you arrive on Anegada, you can rent a Jeep, bike, scooter or use taxi service. Check with the facility where you are staying for rates and availability.